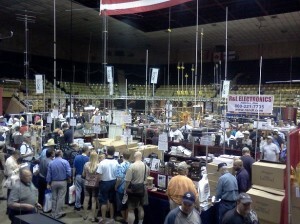 We are at Hamvention® this week! Yes, it’s time to make the annual pilgrimage to Dayton, OH and the biggest Amateur Radio get-together in the world. The Handiham booth will be in the Silver Arena, not far from the meeting rooms. When you head over to attend a presentation, take a short detour to booth SA #330 and say hello to us. If you have a service dog or use a wheelchair, no problem – we always place our display at the back of the booth area to allow you plenty of room to relax out of the aisles. Pictured: A view of the main arena at the HARA facility. Amateur Radio manufacturers, publishers, and dealers fill this space with some amazing goods and services – anything you might need to set up your station. Look at all the antennas in this photo! It’s a good thing the arena has a really high ceiling. I hope you will be attending Hamvention®. It’s about making things… New things. If you can’t make it to Dayton, you might want to tune in to the W5KUB Helmetcam webcast. Hamvention® is May 16 – 18, 2014. Important! Beginning May 9, our old email addresses that end in either courage.org” or “couragecenter.org” will no longer work. Our new addresses will be effective beginning on May 9, 2014. Please use these new addresses beginning Friday, May 9th. Mail sent to the old addresses will not be answered. A firewall issue has cropped up and is causing W0EQO to become unusable. We apologize for the inconvenience. The station may appear to be available at times, then go offline.